Hands up who loves Banana Bread? Growing up in our house it was always “Banana Cake”. To be honest I’ve never really understood what the difference is, if indeed there is a difference at all. I was always a bit secretly pleased to find the bananas had gone brown, it meant Mum could be convinced to whip up a banana cake for us. 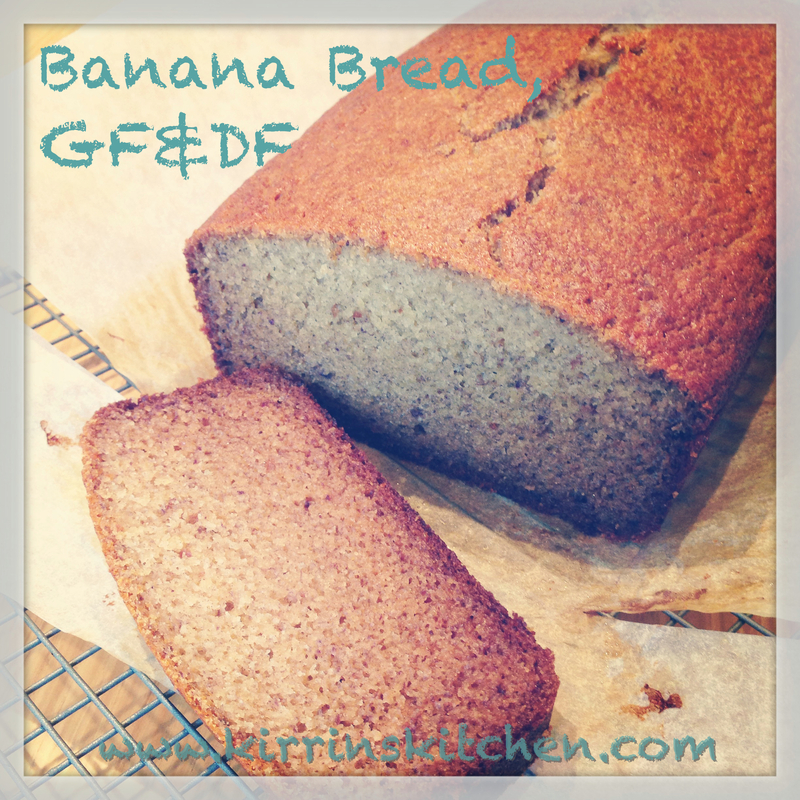 I haven’t had much luck with GF banana breads recently. I’m not sure what has been going wrong but they’ve been collapsing and tasting a bit too much like bi-carb, perhaps too much bi-carb? It’s the one cake I hadn’t been able to perfect with the Thermomix. I was using the recipe from the Recipe Community but was starting to get fails with that one too. I think I have now fixed the issue. I’ve put together this new recipe, which has been consistently perfect in shape and tastes better too. Even better, it is quite low in added sugar (yes I realise that there are sugars in both the bananas and dates, but it is cake after all). Next time you accidentally-on-purpose let your bananas get a bit brown this is the perfect way to use them up. Pre-heat oven to 180 degrees, line a medium sized loaf tin. Weigh dates and boiling water into a small bowl, leave to soak for 5 minutes. Pour into the cooking bowl, mix 1 1/2 minutes, 60 degrees, Speed 2. Add bananas, blend 5 seconds, Speed 5. Add sugar and DF Spread/oil. Mix 20 seconds Speed 3. Add Eggs, mix 20 seconds Speed 4. Add remaining ingredients, mix 20 seconds Speed 4. Pour into lined tin and bake for 1 hour, or until a skewer comes out clean. This entry was posted in Breads (including GF), Cakes and tagged banana, Bread, cake, dairy free, gluten free, recipe, Thermomix. Bookmark the permalink.